Closed rehearsal with Springsteen and the E Street Band along with the backing singers. "Sufferin' In The Land" is the Jimmy Cliff song - this rehearsal is the only time it is known to have been played, and seems to unusually feature Roy Bittan on alto saxophone. 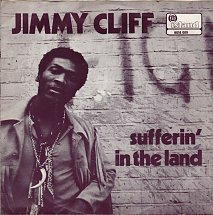 "Sufferin in the land" is taken from the album "Jimmy Cliff", a 1969 album by Jimmy Cliff. It was retitled Wonderful World, Beautiful People after the track of that name was released as a single in the U.S. Richard Polak, who is credited with the sleeves of a number of Island Records artists in the early 1970s, is credited with photography.